Hello, Gustave here once again. I realize there has been a long gap in this journal so I will remind you in case you forgot: I am a singer of the cabaret. And with me is my friend, Nhar. Last we wrote to you, we were opening a show at Triskelion Arts in Williamsburg in February. That show was an excellent success, but unfortunately we had an accident with a forklift just as we were about to leave New York, and so we were detained for a few months. Luckily, we lived, and also luckily, we are back in tip-top shape just in time for the Winnipeg Fringe Festival, where we are performing our show, Cabaret Terrarium, from July 15 to July 24. Please don’t tell the other cities this, but Winnipeg is our favorite city in Canada. You have many fine places to visit. The Forks. The Legislative. Osborne Village. Also in every stall in every parking lot you have an electrical outlet that says “for block heaters only.” If you don’t know what this means, then you live somewhere warm and it’s better if you just stay not knowing in this case. What you don’t know cannot disturb you. We have not been to Winnipeg in seven years, and we want to tell the people of Winnipeg that we are so happy to be back. We will see you soon. Then, at the 21st St Station, the conductor he say there is a delay for track work. We will be moving shortly, he say. Every half hour he say once again, we will be moving shortly. After twenty hours, it’s 5 pm on Friday. We start to get a bit worried we are not going to make it to our show. The conductor, he come around the train with snack for people while they wait. He have small Snicker, Chex party mix, also homemade rice crispie treat. But the people on the subway they are not happy. Bon, Nhar and myself, we are quite happy to have the snack. Especially the rice crispie treat. We say to the conductor, thank you so much for the snack. The conductor he say ah! You are the only people who have been nice to me all day. What’s that, a postcard? Oh, it looks like you have a show to do! Please, come this way. We have a teleporter for if people really have to get somewhere, but nobody ever ask me nicely. We say thank you so much, Mr. Conductor. And we go into the conductor booth at the front of the train, and the conductor he push the teleporter button and we end up in the Nassau Station in Greenpoint. Then, we walk south on the side of McCarren Park to Williamsburg, and we arrive at Triskelion Arts. After all, we had a beautiful opening night of our show, Cabaret Terrarium. The new curtain was excellent. And the audience, they were also excellent. We invite you all to see the show. We have five more performance in New York: Saturday, Feb. 6 at 8 pm, Sunday, Feb. 7 at 8 pm, and also next weekend Friday and Saturday (Feb. 12 and 13) at 8 pm and a matinee on Sunday Feb. 14 at 3 pm. And then, we move on. Always we must be on the road with the cabaret. Bon, hello, you have found the diary of myself, Gustave. I am a singer of the cabaret. With me is my friend Nhar. We are doing a show in New York on Friday, February 5 called Cabaret Terrarium, but we’ve had a hard time getting there. Three days ago, I was stuck in a tree in Switzerland. Two days ago, I was stuck in a snow bank in Kyrgyzstan. Yesterday, I was stuck in the airport in Vladivostok, Siberia. You can read more about the places I was stuck in the diary entries below this one. Bon. Yesterday, at the airport in Vladivostok, the woman at the ticket counter her name is Olga. She told us we just missed the plane to New York, and they only go once a week. We say Olga, we have to get to New York by Friday, the day after tomorrow. She say what’s your hurry, my friends? I say we have a show to do. 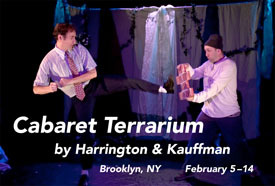 It’s called Cabaret Terrarium, it go from Friday, February 5 to Sunday, February 14 at Triskelion Arts in Brooklyn. Here’s a postcard. She look at the postcard and she say yes of course, you have to be there Friday, you are doing a show. Well in that case I know someone who can help you. My cousin Mischa, he have a company in Shanghai, he always have a good idea. I say Shanghai? Isn’t that a bit far? Also in the wrong direction? She say my cousin Mischa, he’s really smart. Also Shanghai is really warm. You guys look cold. Here, you can take my speedboat. It’s quite fast. So Nhar and myself, we get in the speedboat of Olga and we go to Shanghai. We arrive at sunset. I have never before seen a city so big like Shanghai. We go downtown to the Shanghai World Financial Center, the tallest building in the world outside of Taiwan or Dubai. On the top floor, we find Mischa at the headquarters of his company, Very High Jumping Ninja Ltd.
We say Mischa, your company, Very High Jumping Ninja Ltd., what does it make? He say, we make suborbital stratospheric passenger jet. We can get you anywhere on the planet in two hours. We have a plan to show the world this new airplane for the Chinese New Year festival next week. Why do you ask? I say bon, we have to get to New York by Friday for our show, Cabaret Terrarium. I show him the postcard. He say, why didn’t you say so! Of course, we can fly you to New York. You can go in the morning. You will be a day early, just in case. But don’t tell anybody how you got there. The airplane it’s supposed to be a surprise for next week. I say thank you so much, Mischa. You have saved our cabaret. That night, we see the sights of Shanghai. We see Nanjing Road, we see the Yuyuan Garden, and also the Jade Buddha Temple. The next morning, we get in the plane and we go up and up to the edge of the atmosphere. It’s a beautiful planet, the Earth. You have a lot of cloud, ocean, also some land. We go over China, then Korea, then Siberia (we say hello to Olga), and then some ocean, then Siberia again, then Alaska, Canada, and bon, we are over New York. We drop back down into the troposphere. The pilot he can’t land, because then the plane wouldn’t be a surprise for the Chinese New Year, so he eject us with parachute over the city. Nhar and myself, we land in Forest Hills, Queens. We go to a deli and we say excuse me sir, can you tell us how to get to Triskelion Arts in Williamsburg? The guy he say, ah, yes. You take the G train. You will have no problems. So it looks like things they are in the bag. What could go wrong getting from Queens to Brooklyn on the G train? We will write again tomorrow just before the show. Bon, hello. It’s Gustave again. A lot of things have happened since yesterday. Nhar and myself and our Kazakh friend Alibek who flew the helicopter, we were stuck in the snow on the mountain face in Kyrgyzstan, certainly to die of hypothermia and frostbite also. (If you want to know what I am talking about, you can read our diary from Tuesday, 2 February). First, Nhar he have an idea: with his last breath, he make the sound of a mountain goat. It’s a good sound. It is one of the specialties of Nhar. A Kyrgyz sheepherder guy in the next valley, he know the mountain goat they don’t normally make noise in the middle of the night, so he come to take a look. He find Nhar and myself and our Kazakh friend Alibek almost frozen stiff. The Kyrgyz guy, his name is Rahat. Rahat he carry us back to his hut and he give us some sheep soup, and he give us sheepskin beds to sleep. In the morning, Rahat he slaughter a sheep for us for breakfast. While we eat, we look out over a big valley. And I wonder to myself how we are going to get to New York on time for the opening of the show on Friday, now that the helicopter is broken. It’s a beautiful country, Kyrgyzstan. Many river, lake, mountain, also sheep. Rahat he tell us a story about how the Kyrgyz people they got to live in such a beautiful place. When God he was finished making the world, it turned out he made a mistake and he didn’t leave any room for the Kyrgyz people. They went to God and they say bon, we don’t want to complain, but you forgot to make for us a place to live. God he say oh my god! You are right. Please, take this property I was going to use for my vacation resort. The Kyrgyz people they say thank you so much God, we will take it. And that is how the Kyrgyz people they end up to live in the most beautiful country in the world. Our Kazakh friend Alibek he say Rahat, you are right! Kyrgyzstan IS more beautiful than Kazakhstan. Also I am tired of the helicopter-flying business, so I will stay here in Kyrgyzstan and I will go into the sheep-herding business. Our Kyrgyz friend Rahat he say ah Alibek, that’s a fine choice. For me also sheep-herding is a second career. I used to take care of the old national personal pneumatic tube transport system for Party members to travel in the USSR. Now my life is a lot more quiet, I am happy. Gustave and Nhar, would you also like to stay here in Kyrgyzstan and herd the sheep? I say bon, Kyrgyzstan is beautiful, but Nhar and myself, we have a show to do in three days in New York. It’s called Cabaret Terrarium, and it opens this Friday, February 5, at 8 pm, at Triskelion Arts in Williamsburg, Brooklyn. It go until February 14. Here is a postcard. Then I say Rahat, do you think we could use the pneumatic tube system to get to our gig? Rahat he say I think it’s a bit dusty, but you can try. It will take you as far as Vladivostok in Siberia, and you have to figure it out from there. I am happy to give you an animal which can take you to the tube entrance in the valley. I say, how can we get there on time if we are riding on a sheep? He say no, you will take a horse. So Nhar and myself, we say goodbye to Alibek and Rahat and we ride to the pneumatic tube entry duct. It look like a well. We get in the canister of plexiglass, and hoopla! We are sucked into a tunnel of solid rock! We rush for a long while, and then we slow down in a station. On the wall of the station, we see many big statue of Soviet leader. You have Lenin, Stalin, Malenkov, Khrushchev, Brezhnev, also Kosygin and Mikoyan from the troika, then Andropov, Chernenko, and Gorbachev. He was the last one. Now they have democracy in Russia. We get out of the tube and a woman she say bon, welcome to the airport in Vladivostok. My name is Olga. Unfortunately, you have missed the last flight to New York, it was five minutes ago. I am so sorry. So Nhar and myself, we are stuck in Vladivostok, sitting in front of the ticket window of Olga, and Cabaret Terrarium it open in two days. Nhar, he doesn’t have any idea. I don’t know what we are going to do. Please check back tomorrow to find out. Bon, It’s Gustave again, here with my friend, Nhar. You are wondering what happened with the branch of the tree (you can read our diary from Monday, 1 February if you want to know what I am talking about). Well, it start to crack. We can see the white part of the wood in the center of the branch, it separate slowly from itself. It smell quite good and pine-fresh. The air in Switzerland, it is quite nice. Just before Nhar and myself we fall completely and tumble to the ground and break all our bones, a helicopter it fly by and drop us a rope ladder. Nhar he go first, and then I grab the ladder with one hand while the branch of the tree it fall away and it crash to the forest floor. Nhar, he help me to climb the rest of the way up the ladder. The guy in the helicopter, his name is Alibek. He is from the city of Almaty, in Kazakhstan. He say, he is going to Kazakhstan. If we want to go with him to Kazakhstan, that’s OK, and if we want to go somewhere else, then we can go with him to Kazakhstan and then we can take a bus or a plane somewhere else. So I say to Nhar, Have you been to Kazakhstan? and Nhar he say no. So I say to Alibek, Bon, we can go to Kazakhstan. Alibek he say we will not be unhappy because in Almaty, Kazakhstan, you have the most beautiful girl of any city in the world. So we fly east over Italy, Slovenia, Croatia, Serbia, Romania, then oh! The Black Sea, it’s so nice water. Before long we are over the Crimea part of Ukraine, where they had a war a long time ago. Then a bit of Russia, and then, oh! We are over Kazakhstan. It’s a beautiful country, Kazakhstan. You have a lot of river, lake, mountain. Also apples. It’s also a very big country. We fly over a lot of place with not too much going on. Then, we get close to Almaty, but unfortunately we have a big weather problem. A snow storm it blow us in our helicopter off course to the south, and we have to land in the middle of Kyrgyzstan, in a snow bank on a mountain in the dark. The helicopter, it’s broken and it cannot fly. But we are OK. Except it’s very cold. Alibek he say, I’m sorry, I have brought us here in the middle of nowhere and I don’t think we’re going to make it out. I say don’t worry Alibek, Nhar he will think of something. Then Nhar he look down at the snow, and he see a postcard. It’s another postcard for our show, Cabaret Terrarium, opening this Friday, February 5 in Williamsburg, Brooklyn, New York! This is good, because in all the confusion with the branch of the tree breaking in Switzerland, we forgot to get the postcard for our show. Unfortunately we may now die tonight. But it’s good to know the people of Kyrgyzstan they want to come to our show in Brooklyn. It would be better for myself, and for Nhar, and also for Alibek and also for the people of Kyrgyzstan who want to come see our show, if we could get out of here alive and make it to our show on Friday. Please check back tomorrow to see if we survive through this night of wind and snow. It’s Gustave here, singer of the cabaret, with my friend, Nhar. Soon we will do our show, Cabaret Terrarium in New York City, but we want to give you a travelog of what we are up to in the next few days before the show start on Friday, February 5. We will be so happy to be in New York. Bon. So. Last night, Nhar and myself we did a cabaret gig in Lausanne, Switzerland. This morning, we see two guys in the park, playing chess, with life-size chess piece, on a chess board on the cement, painted. Nhar he played the winner, and he got for himself a prize: one cup of excellent coffee from Colombia, from the kiosk next to the chess board. The guy who ran the kiosk he is from Bern, in the German part of Switzerland, and he say his brother he own a small ski rental shop in Bern which he turn into a cabaret club at night. So we say bon, we go there. And Nhar and myself, we get on a train and we go northeast, towards the city of Bern. It’s a beautiful country, Switzerland. Many river, lake, mountain. Also more mountain. And a lot of snow, even in the summer. And in Switzerland, even in the medium-size city like Bern and Basel, you cannot buy anything after five o’clock. If you want some toilet paper or perhaps some batteries, you have to go to the post office. They close at eight. Bon. We are on a very fast and clean train on the way to Bern, when Nhar he see a big hill with beautiful trees. There is something shiny about halfway up to the top, and Nhar he want to see what it is. So, we get off the train at a very tiny station. It’s not so much a station, it’s more some steps made of wood. We walk into the forest, and we go up the hill. We are grabbing rocks and trees for balance. Also, small bush. My red tie it get stuck on branches two times, but I can to burst free both times with no serious damage to my tie. It seems, luck is with me still. Finally, we reach the tree. We climb up and out to the branch with the shiny thing. We crawl closer, and closer, and oh! We see it’s a postcard. It’s a postcard for our show, at Triskelion Arts in Brooklyn, in New York City, starting Friday, February 5. But we already knew that. We are very excited to do our show in New York. We love New York. But now unfortunately we are stuck at the edge of this branch of the tree, and it’s starting to break. That would not be so good. It’s a long way down, and if we survive, we would probably still miss the show in New York on Friday. We start to think, perhaps it would be good if a helicopter flew by us now, with a rope ladder for us to climb up. Please check back tomorrow to see if we make it.